From Toronto to Charlottetown, this 15-day tour is full of surprises. 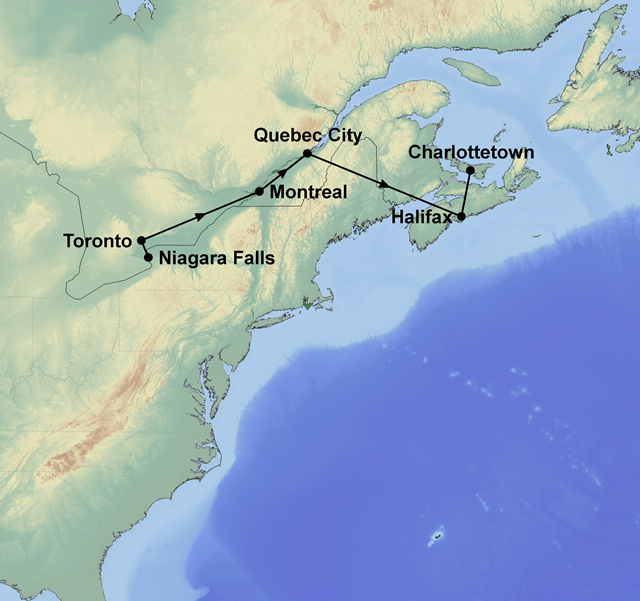 See Niagara Falls, Montreal and Quebec City. Your Nova Scotian adventure begins on a VIA Rail train to Halifax. Step back in time when you visit the beautiful fishing town of Lunenburg and picturesque Peggy's Cove. Prince Edward Island provides the backdrop to this stunning tour finale, including an Anne of Green Gables Tour. Accommodation in clean and comfortable hotels with private facilities, meals as indicated (B=breakfast, L=lunch, D=dinner), Niagara Falls Excursion, VIA Rail economy class fares: Toronto/Montreal, Montreal/Quebec City, VIA Rail fares including cabin for two: Quebec City/Halifax, Heart of Montreal Tour, Lunenburg and Mahone Bay Tour, Peggy’s Cove Tour, Prince Edward Island and Anne of Green Gables Tour. Day at leisure to enjoy this great multi cultural city. You might like to visit sights such as the University of Toronto, Yorkvillage, CN Tower, Skydome and the Harbour-front. Enjoy a full day tour to one of the seven natural wonders of the world. The tour includes a ticket for the Maids of the Mist boat ride. Time is available to explore Niagara Falls on your own before returning to Toronto. This comprehensive tour covers various points of interest including the Old Port, Mount Royal Lookout, Olympic Park, McGill University, Chinatown and the Notre Dame Basilica. Day at leisure to discover one of the most beautiful cities in the world. You may wish to visit sights such as the Latin Quarter, Plains of Abraham, Ramparts, world famous Chateau Frontenac, National Assembly, Basilica, City Hall, Place Royale and Citadel. The craggy coastline along the south shore of Nova Scotia has a fascinating history of fishing, boat building and rum running. 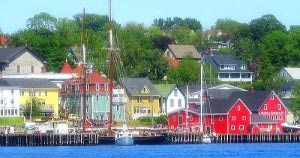 On this scheduled tour you visit the village of Lunenburg, home to the largest fishing fleet in the region. This picture postcard village is situated on the rugged Atlantic shoreline. It has long been an artists and explorers paradise. The local lighthouse is one of the most photographed in the world. Tour the beautiful north shore area. The tour includes photo stops at quaint little villages and lighthouses. A number of scenes from the Anne of Green Gables movies were filmed on Prince Edward Island. You will visit an old farm site that inspired this much loved novel.